Storey Publishing, LLC, 9781612121888, 456pp. Adam Danforth trained at the professional meat processing program at SUNY Cobleskill, one of the only such programs in the United States, before going to work at Marlow and Daughters in New York City. He’s also worked as a butcher at Blue Hill and teaches home butchering workshops at the Stone Barns Center for Agriculture. Danforth also works with individual farmers who are slaughtering animals for themselves, and because of that, he has a keen awareness of the needs of farmers, especially those who may be killing an animal for the first time. He lives in Ashland, Oregon. Joel Salatin is a farmer at the forefront of the trend toward local food and grass-fed meat. His Polyface Farm has been featured in Smithsonian magazine, National Geographic, Gourmet, and countless other radio, television, and print outlets. When he was profiled on the “Lives of the 21st Century” series with Peter Jennings on ABC World News, his after-broadcast chat room fielded more hits than any other segment to date. Polyface Farm achieved iconic status when it was featured in theNew York Times bestseller The Omnivore’s Dilemma by Michael Pollan and the award-winning film documentary, Food, Inc. Salatin is also the author of eight books, including Everything I Want to Do is Illegal, Holy Cows and Hog Heaven, and Folks, This Ain’t Normal. "These are not mere how-to guides: they are the equivalent of in-depth college courses." 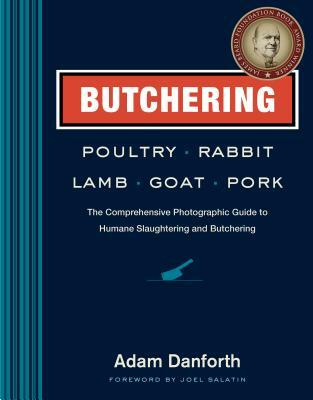 "Breathtaking guide through the paradoxical process of killing animals with compassion. ... a transformative wake-up call."